Not just any fishing rod will do even if you're a skilled fisher. Some prefer the efficiency of a spinning reel while others like beginners opt for a spincast which is much easier to use. Activities like fly fishing, meanwhile, need the help of a fly rod while ice fishers benefit from an ice rod. So why all this categorization? It's because fishing may be done on freshwater or saltwater, distance, number of cast times and resistance needed when fishing for large fish. The rod's construction material also plays a part in determining how strong and effectively it can land a catch. First-time fishers can get accustomed to the art of fishing using a spincast reel. Easy to use and cast, inexpensive, and not complex, it combines spinning and casting actions. The line remains stationary until the cast button is pressed. Spincast reels are so easy to use that they're regularly designed for children. The drawbacks, however, are loss of some accuracy and inability to go far distances which experienced fishers will find pointless. Still, first-time fishers are advised to use spincast reels if only to get a feel of a rod. Where spincast reels are recommended for children and beginners, a spinning reel is popular with experienced fishers. More accurate than a spincast, it's great for distance as it has a capacity for longer lines. 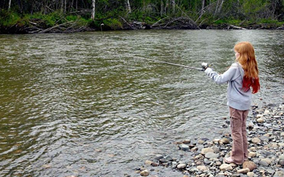 Spinning rods are versatile in that they can be used for two-handed casting as well. With the reel hanging beneath the rod, comfort and ergonomics are increased to make it the most popular type of fishing rod. Use it once you've mastered a spincast. Considered for use only by seasoned fishers, baitcast reels have the best to offer in accuracy and weighty lines. A traditional fishing rod, they're shaped like spincast reels but have exposed spools of line similar to that of spinning rods. Baitcasts provide a lot of power so are used to haul large catch. Experienced anglers say they provide more of a feel compared to spinning reels since the reel is placed closer to the pole. The cost of baitcasts is much higher than spincasts and spinning reels which deters fishers from buying them. It also takes skill to use one since the right amount of pressure must be applied to the spool when the line is cast. Still, these negatives don't daunt seasoned anglers and professionals participating in fishing competitions. Ice rods are designed specifically for ice fishing. Much shorter than the usual rods, they measure only two to three feet in length. Conventional ice rods consist of a rigid length of stick, hooks, line guides and a handle. They're still widely used despite more sophisticated reels. Modern fishing rods are made of either fiberglass or graphite. The better choice depends on the fisher's preference. Graphite rods are very sensitive, allowing you to react quickly. This is both a benefit and a disadvantage as some fishers say they tend to set the hook too early and lose fish. Fiberglass is believed to be heavy but this isn't really the case. A properly balanced rod, whether fiberglass or graphite, is what influences weight. As for action, both materials perform the same. What you should look for is range of action, whether fast, moderate and slow which is determined by the overall construction of a fishing rod. Boat fishing rods are ideal for boat fishing and is perfect for chasing.They can be used to catch just about anything from snapper to tuna. Refer this link for additional details.